A generous local family have paid for a day of hospice care today in memory of David Hayman, who died at our hospice in August last year. Their gift will cover all of the services we offer including our inpatient care, our Wellbeing services and our community nursing visits. The family have chosen today as a fitting tribute to David, handing over their cheque on his birthday. It was our privilege to be there for David and we’re touched to receive such a large and thoughtful gift from his family on this special day. David’s daughter, Anita, says, ‘Dad passed away in August last year and he was in the hospice for his last few days. He overlooked the beautiful South Downs and he was made to feel safe and felt loved by the amazing professional staff – he called the nurses his angels. ‘It seems a funny thing to say, but he died well, all thanks to these remarkable people. 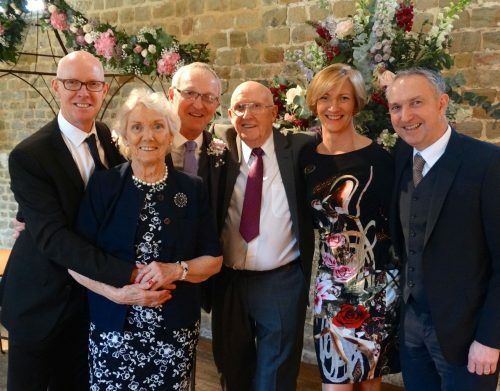 I’m sure most people can relate to our family’s story and have been touched by the hospice in some way – which we are so lucky to have on our doorstep. With their inspiration found, the Hayman family threw themselves into organising the sell-out event, which was hosted at Burgess Hill Girls’ School. A variety of local talent took to the stage and wowed the audience, who spent the majority of the show on their feet! The incredible night of entertainment raised over £5000 and received brilliant feedback. Thanks to the Hayman family, we’re able to provide expert and compassionate hospice care to local families today who are going through what they did. What a beautiful tribute to a wonderful man.